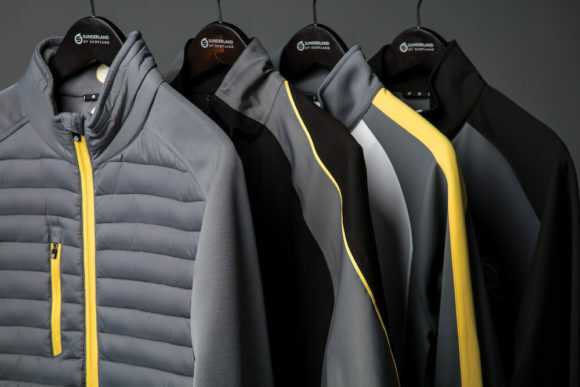 Sunderland of Scotland, the world renowned technical golfwear brand, has revealed its collection for Spring/Summer 2019. Combining quality, playability and reliability, the collection captures the essence of Sunderland of Scotland’s ‘Never Weather Beaten’ mission. The collection is built from high performance garments to protect from rain wind and the cold. The menswear Whisperdry Luxelight Jacket (RRP £150) is featherlight, breathable and fully waterproof with stretch. It is the lightest jacket in the collection and the design incorporates ergonomic sealed seams to enhance freedom of movement and high neck with draw cord adjuster. Windshirts are a focus of this collection; made from a three-layer interlock four-way stretch fabric, the tops deliver an extremely windproof and shower resistant option whilst remaining lightweight. The Nevis (RRP £80) is added to the collection in Gunmetal/Energy Yellow and its half sleeve counterpart the Himalayas (RRP £75). The midlayer collection has been enhanced with the addition of the new Vallon (RRP £60), which is a super lightweight, four-way stretch heat insulating fabric that has a tricot backing to stop the product from sticking to undergarments enhancing freedom of movement. The Aspen (RRP £70) midlayer protects from the elements with its Teflon-coated interlock stretch fabric. A striking effect is achieved with the flash of yellow enhancing the sleeves and zip. Sunderland favourite Montana (RRP £110) is refreshed for this season with the Fire/Red colourway. Made from a lightweight polyester technical fabric with mechanical stretch the paneling achieves a slimmer silhouette. Following the success of the men’s padded collection, the new Tania (RRP £75) padded gilet has been introduced which is shower and wind proof with stretch side panels in three new colours. The Nova (RRP £80) is revived in this collection in a bright Fire Red, the brushed polar fleece jacket is insulating and effective at protecting from the cold. 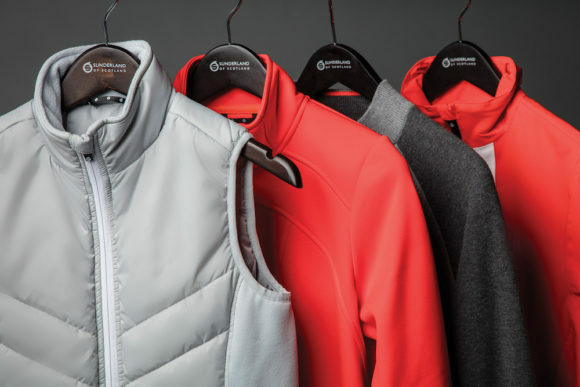 Claire Woods, Head of Design at Sunderland of Scotland, said: “The Sunderland of Scotland brand has truly been revived as a leader in innovative and high performance golf clothing. The Spring Summer 2019 collection continues to evolve the Sunderland brand combining cutting edge fabrics, vibrant new colours and contemporary sport design”.